A Simple, Disposable sleeve with surprising benefits. 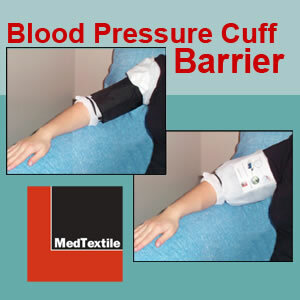 The Blood Pressure Cuff Barrier is a better solution in the fight against cross-contamination than expensive, disposable blood pressure cuffs or disinfecting cuffs. The BP Cuff Barrier is a single-use, sleeve-like barrier that protects patients and nurses' gloved hands from contaminants. 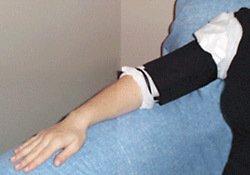 Apply the BP Cuff Barrier with extra fabric at the top. Apply the cuff as usual. Fold the extra fabric down over the cuff. 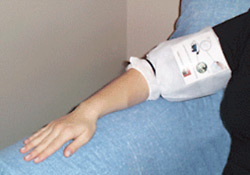 A special plastic coating is applied to the Original BP Cuff Barrier design. Designed and tested to help prevent fluid penetration.